If You're Not Gaga Over #GoogleGlass, You're a Bad "Explorer"
About two months ago, I plunked down about $1,600 to get a pair of Google Glass. I have an iPhone. No plans to switch. That means that, at this point, I don't have GPS, one of the most coveted features of Glass. I do have my calendar, photography, videos, occasionally the ability to Google and ask Google questions ala Siri, and the ability to make phone calls and share items with friends. For the mainstay of Glass functionality, however, you need wifi. When I got Glass, I upgraded my AT&T iPhone plan so that I would have a personal wifi hotspot for Glass. The result? Sometimes I have connectivity, though most of the time I don't. On occasion, when I do have wifi connectivity, I have gotten the Google equivalent of a "Fail Whale", a message telling me that Google can't be reached at the moment. Without wifi, you are pretty much left with an expensive camera/video. So I just stopped by an AT&T store tonight to increase my data plan and mentioned my problem with Glass (and laptop) connectivity. The rep was quick to say that the iPhone wifi hubspot really isn't all that good and that I should get myself an AT&T wifi hub device, the "Unite", for twenty bucks a month. He said I should see a big difference. 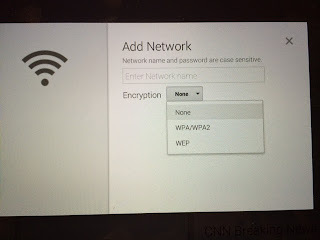 Now, you may be shaking your head at me not knowing whether to answer "WPA" or "WEP", but I'm going to guess that a lot of other consumers are going to be stumped by the choice - and, yes, we can Google it, but should we have to? As a lawyer, I have been trained not to use any terms someone may not understand without explaining them. Would it be too much to have a notation underneath explaining the difference or offering some technical guidance? But, that's a minor, UX (user experience) point. Thinking it would be just as easy for me to try one, then the other if the first didn't work, I did just that. Both failed to connect, despite generating a QR code (part of the new network registration) and a signal saying that Glass was connecting. 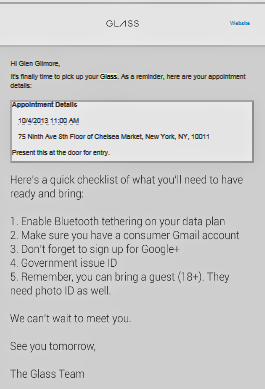 So, when I get a moment, I'll try and stop by Google in NYC to see if they can help me. I don't have the time to go searching for an answer. ("Then maybe you don't have time to be an Explorer," someone will be quick to intone. I realized when I ventured into the program that my approach to exploring would be somewhat passive, seeing where the stream of iterations might take me, rather than me boating to different destinations.) Should it be so difficult? I think not. But, Beware Suggesting that You Are Not Thrilled with Glass Or You May Be Targeted a "Bad Explorer"
When I have raised a general sense of disappointment with Glass, the response from some Explorers has to remind me that I signed up for a beta project, that cool stuff is being done in medicine, that cool recipes are being shared every holiday, etc., etc.. Blah, blah, blah. I would just like to be able to say that I have something that is pretty cool and easy to use, that makes my day a little easier and more interesting. Nearly everyone is pretty excited when they first look into Glass. It would be much cooler, I would have to think, if I had connectivity on a consistent basis. I'm not a "techie" in the traditional sense. I do still have trouble, at times, with the television remote. I do, however, keenly track trends in technology and try to decipher their implications on our lives. When I was invited to become a "Google Glass Explorer" by friends at IBM, I asked, "Why?" What was so compelling that I should spend about $1,600 for a device that might soon be released to the general public for much less than that. "It's Really, Really Cool - And You Test Drive It Four Months Ahead of Anyone Else"
The answer I got was pretty much that the device is really, really cool, and that I would have the opportunity to test run a disruptive technology months before the general public - anywhere. So, here it is: since I have this privilege of becoming a Google Glass Explorer, I feel obliged to share my journey. I'll be sharing some posts like this, nothing fancy, to record my journey and share my learning. Since, as I noted, I'm not really a techie, perhaps that makes me a good Explorer candidate. If I fail in my journey, so, most likely, do Jane and John Q. Public. I realize, though, that because of the great community of friends I've gathered in social, I'll likely have more help than most, which I hope will benefit others in their journey and advance the technology of wearable tech. As a non-technie, I'm going to need the help of those of you who are techies. First problem, I gather, is that I use an iPhone and not an Android. What apps should I be using? I really have no idea and "googling" the question hasn't been very helpful. When I was given the Google Glass invite, I asked a question concerning a very common problem: will Google Glass work with contacts. The answer I got was a, "Well...er...they're going to come out with prescription Glass soon." I wasn't going to let no stinkn' contacts stand in the way of my getting Google Glass. I scheduled an emergency appointment with my dear friend "Dr. D", a.k.a., Dr. Nick Despotidis, OD, FCOVD, FAAQ, FIOA (eye doctor) of Eye Care Professionals for his help. I told him I had researched and learned about new "multi-focus" contact lenses (if I wear contacts, I need reading glasses - naturally.) So my eye doctor instantly understood how important this Google Glass quest was for me and dismissed the idea of prescribing the new-fangled, multi-focus lenses. Instead, he said, he would "dedicate" my right eye to Google Glass by prescribing a lense fitted to the Google Glass explanation of how the display screen appears to the average viewer. I have been fitted with a couple slight variations of this prescription to increase the prospects of my contact working with the Glass. UPDATE: The adjusted contact worked like a charm. The screen is easy to read. To be clear, what my eye doctor did was to not fully correct the near-sightedness in my right eye, the Google-screen side, allowing me to clearly read the Google Glass screen while still having slightly-improved sight in that eye for distance. So there you have it. Installment One of my Google Glass journey. And tweet me your thoughts and suggestions at @GlenGilmore and @GlassExploring (An account dedicated to my exploration of Glass.) Thanks! "Boots on the ground." For a world too familiar with war, the meaning of the phrase is chillingly clear: soldiers on the ground, in harm's way. Lives likely to be lost. Young men and women likely to be maimed. 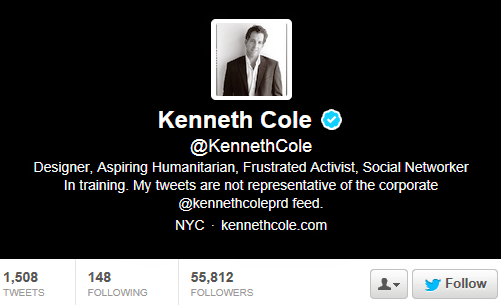 Kenneth Cole, namesake of the Kenneth Cole fashion house, describes himself in his Twitter profile as, first and foremost, a "Designer", but also as an "Aspiring Humanitarian" and "Social Networker in training". So, was the tweet about "Boots on the ground", "sandals, pumps and loafers" in the store, the poor judgment of a crass designer looking to hawk his wares, the plaintiff voice of an "Aspiring Humanitarian", or the stumble of a "Social Networker in training"? Just Lil' Ole Me Looking to "Provoke Dialogue"
For those skeptics who thought that by including the hashtag, #Footwear, Kenneth Cole was more likely than not merely looking to sell a few more "sandals, pumps and loafers" by cashing in on the specter of armed conflict - wrong. Or, at least, that's what Kenneth Cole would like us to think. "I am well aware of the risks..."
I have always used my platform to provoke dialogue about important issues, including HIV aids or homelessness. I am well aware of the risks that come with this approach, and if this encourages further awareness and discussions about critical issues, then all the better. Did we really need Mr. Cole's tweet to call awareness to the issue or to encourage discussion about military action that is dominating every news headline and being debated on nearly every news show and coffee shop? Comments posted to Cole's Instagram video explanation range from "Power to you. #stirthepot" to "Wow. I am genuinely impressed by the magnitude of bull**** in this video. Bravo, sir." I must confess that my view of the this entire controversy is tainted by my familiarity with a much earlier Kenneth Cole tweet. In fact, it is a tweet that I always use as an example of social media selling gone bad in a module I teach at Rutgers that touches on crisis communications. Oops, I did it again!....But, this time I meant to! Mr. Cole's "Boots on the grounds".... "sandals, pumps and loafers" in the store tweet sounds strangely familiar...as does his no-apologies response. "I apologize to everyone who was offended by my insensitive tweet about the situation in Egypt. I’ve dedicated my life to raising awareness about serious social issues, and in hindsight my attempt at humor regarding a nation liberating themselves against oppression was poorly timed and absolutely inappropriate." "Think before you tweet." Simple enough as a basic rule for minimizing the risk of a social media crisis. "'Boots on the ground' or not, let's not forget about sandals, pumps, and loafers. #Footwear "
As in the immediate aftermath of his #Cairo tweet, Mr. Cole has also once again reminded us of his pedigree of social activism. Perhaps as with his #Cairo tweet, we will later learn that this, too, was another attempt at interjecting humor in addition to sparking discussion. I would have thought, though, that Mr. Cole would have learned by now that humor and death do not mix well. While Mr. Cole's Twitter profile asserts that his "tweets are not representative of the corporate @kennethcoleprd feed" I find myself hard pressed to separate the two, as Mr. Cole has thoroughly blended the two. There have been times in which I have wondered if have been too rash or harsh in my feelings towards Kenneth Cole, the man and the brand, following the #Cairo fiasco. This latest episode assures me that I have not. Be "Aware of the Risks"
Mr. Cole insists that he is aware of the risks of his tweeting. And, he has, in fact, always promoted a social edginess that might make others uncomfortable. In two grave moments of life and death, however, he has chosen to seemingly promote his products with a trending topic, only to chide us for any offense we may have taken, by reminding us of his social pedigree. I am glad that he is "aware of the risks" of how he chooses to use his social media platforms, as this consumer has had enough. As the founder of a company, Mr. Cole can take his company where he will in his tweeting. I trust that this, too, is part of his awareness. Thank you, Mr. Cole, for once again reminding us of your social pedigree -- and of the risks of tweeting what you will. For IBM, "Smarter Commerce" is both a series of conferences and a smarter way of doing business. This year's gathering, in Nashville, is my first IBM conference. It's being held at the sprawling and magnificent Gaylord Opryland Resort in Nashville, Tennessee. It's a fantastic place to learn about new technologies and techniques that all target improving customer capture, experience and loyalty. I am a guest of IBM at its Smarter Commerce conference, along with about a dozen other "VIP Influencers". The honor came with no request that I blog or tweet, let alone what I should blog or tweet. Just a "come and see" invitation. Have to say that I like IBM's confidence and approach. "Engaging" "influencers" always comes with a measure of risk, as you can never be quite sure what they'll have to say should they decide to say something, blog something, tweet something. Yet IBM's confidence is well placed, as their entire event shows just how much they "get" smarter commerce. Gotta confess that I've always had a blue suit, heavily-starched white shirt, power tie impression of IBM (yes, I often find myself wearing the same uniform). Meaning, I was a bit skeptical of just how good IBM would be at leading others to agile, customer-centric "smarter commerce". In short, I arrived with a healthy dose of skepticism. The reality? While the white-shirt and power-tie industries still do okay with some IBMers, what impresses one most is how passionate and smart IBMers are. A diverse group, they have a keen sense of the need for agility. They are passionate about understanding their customers, their partners, and they are incredible evangelists for their products and services. Rush to judgment? My glowing impression may seem like a broad brush after only two days of IBM immersion, but, rest assured, I have intently listened, met, poked and probed. Everywhere I turned, there was an IBMer to chat with, to listen to - to learn from. "Smart and passionate" is the impression everyone here exudes when you take the time to test them at their craft. Empowered to shine. It seems that IBMers have been empowered to shine with their own personalities and talents -- and they do so quite well. It's a wonderful thing to see employees who are so excited about their brand products and services. Unleash your employees to be brand evangelists. They'll likely do a far better job than you'd ever imagine in converting prospects into customers. Not your grandfather's IBM. The IBM Smarter Commerce expo center is a great spot to see much of the exciting stuff IBM is up to. Let's just say, it's not your grandfather's IBM. It's high-tech. It's cutting edge. And, it's very "social". Wander, stop, listen and learn. Don't worry, no sense of walking through a gauntlet of hawkers like at your typical expo hall. 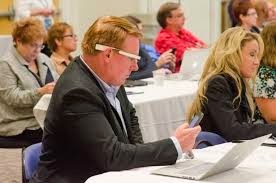 Instead, though the hall is brimming with exhibits, the varieties of technologies and customer solutions being offered let people gravitate to what interests them most. Biometrics: Facial and Voice Recognition Like I said, give an IBMer a moment to tell you about their products and their eyes light up and they'll tell ya just what you need to know. Cool stuff. IBM is looking to make online transactions more secure by layering facial and voice recognition "passwords". Can't these be "gamed"? Stop by and they'll answer that question. "It's about ME!" (Your customer, that is!) Everything about Smarter Commerce is about your customer: how to serve her when, where and how she wants to be served, wowing her every step of the way. From mobile banking, to typical retail, customer experiences are getting better because data capture and analysis are getting much better. Visit the expo and find out what's under the hood! What about the hologram? Yes, I know. It seems a little scary in my Vine video....It's even slightly more so IRL! Speaker after speaker hammers away a pivotal point: "Business must provide customers what they want, when they want it, where they want it, how they want it!" Tall order. IBM solutions, however, are all about figuring out those critical touch points. It's data-driven customer service that focuses on what the customer really wants "today", not six months ago. As keynote speaker and author @JayBaer would say, smarter commerce is about replacing hype, with help. IBM Smarter Commerce looks to deliver both the data analysis and platforms to deliver the "help" seamlessly. At the Smarter Commerce conference, you’ll see how leading organizations are using IBM Smarter Commerce to meet the demands of empowered customers in real time. IBM's "Supercomputer", @IBMWatson? Yah, there's an app for that! What matters is what you hear from your customers. Have a relentless focus on your customers. In a keynote address, Sir Terry Leahy, of Tesco fame, helped capture the essences of "smarter commerce". Explaining Tesco's stunning success, Sir Leahy observed, in a very understated way: "We transformed the customer experience on the basis of data." A leader will take you farther than you can go on your own. You have to find the truth. See yourself as others see you. Leadership has to have the courage to confront what they’re not doing so well. Customers are your most reliable guide. If you listen, they’ll show you the way forward. We all screen out information that is not focused to our needs. Ask your customers what they think your company stands for and what they would like it to stand for -- make their answers your guideposts. Differentiate the experience globally to suit local customers. Call the company to the needs of the customer. Peter Shankman - "Nice Companies Finish First"
Brevity is the new nice. You have about 2.3 seconds to connect with a consumer online. Do the thing you say you’re going to do. Strive to be transparent and relevant. Use the consumer data you have to bring relevant content to consumers. Look for opportunities to dazzle your customers so that you stay "top of mind". Be transparent with your customers about how they can get in touch with you. Triberr founder Dino Dogan on Creating "Insane Loyalty"
There's no such thing as "B2B", it's all people to people. If you can give your customers a special status, they will come back. If you use Twitter, I strongly suggest you search the hashtag #SmarterCommerce for tons of Smarter Commerce nuggets. If you're not using Twitter, no better time to start than now! And I'd love to hear any Smarter Commerce comments you may have! Thanks! And special thanks to IBM, Tami Cannizzaro, Jay Baer, and Michael Ditanna!